Birthdays are a time for celebrating…you, your family members and your friends! But why is it a cause for stress sometimes? It shouldn’t be. I still remember my birthday parties as a kid, vividly. I remember the taste of the cakes I had (yum! ), the games we played and how I felt. That’s the most important part, I felt special and it was my day. Everything including the cake doesn’t have to be perfect. You can make the cake and do it yourself…yes, you can and it doesn’t have to be perfect (I’m repeating myself I know but it needs to be repeated). Because you’re celebrating someone and their birthday, that’s the most important part to remember. Because how you make them feel will be the most memorable thing about their birthday, not how perfect the tablecloth was or how perfect anything was. Believe me, as I’m typing this, I have to remind myself constantly. A perfectionist at heart, it’s hard to let go of perfection. But I know I need to because that stress and that worry to make it all perfect comes at a cost. 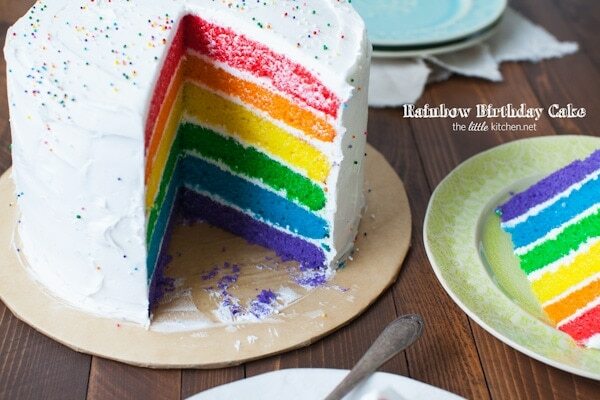 I have always wanted to make a rainbow cake. 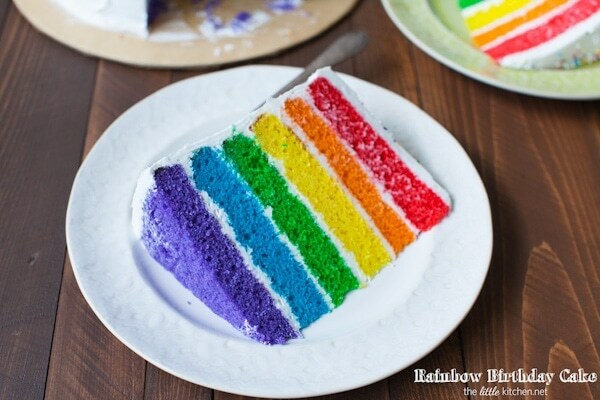 Since I have seen this one, I have always wanted to do it…like seriously on my baking bucket list. So when, I had this opportunity to work with Betty Crocker (so exciting since I’m such a huge fan of the brand! 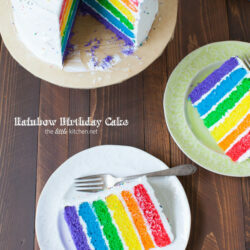 ), I wanted to try my hand at this rainbow cake. A trick I learned a long time ago, trace with a pen along the edge of the cake pan over wax paper or parchment paper. And then cut it out. 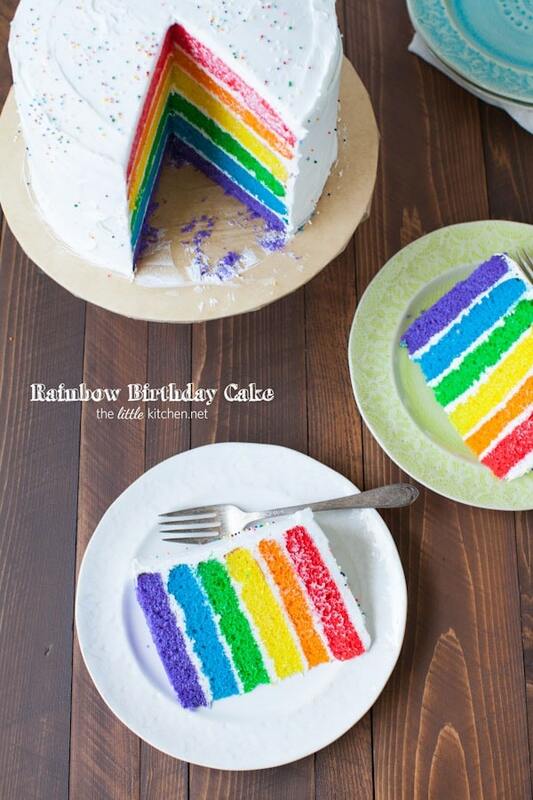 This will keep the cake from sticking to the bottom of your pans! I mixed one Betty Crocker SuperMoist White Cake Mix at a time. Since I did happen to have 3 cake pans that are the same size (I used to be a hobby cake decorator a long time ago). 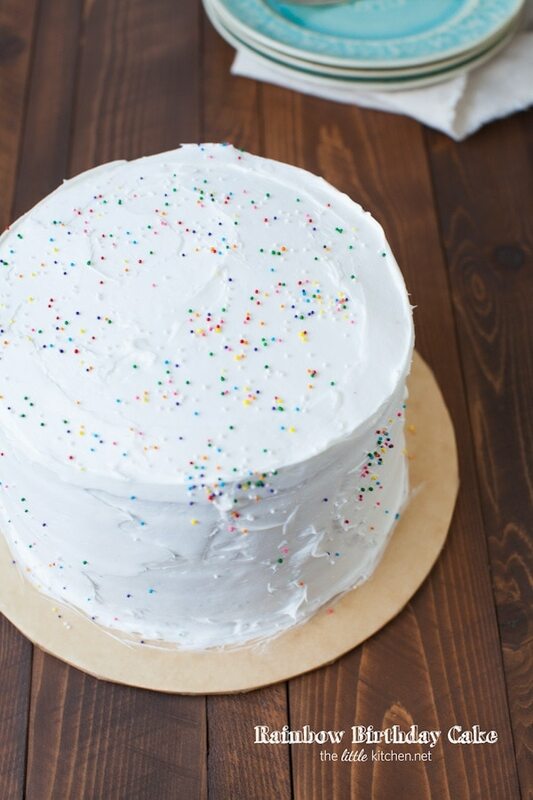 It’s perfect because one box of cake mix makes 3 thin layers perfectly! Mix up the colors and don’t do as I do, mix the purple, blue and green first, it will make your life easier! Allow the cakes to cool completely before handling them (on a cooling rack). Cut the tops of the cakes off to level them off. This is totally optional though. And remember this, the top of the cake is now the bottom of the cake. Remember that. On a plate or cake stand, add a little bit of frosting (this will be like a clue for the cake). I used Betty Crocked Whipped Whipped Cream Frosting, it was so good! Add the first layer (purple), remember the top of the cake is now the bottom. Why do we put the bottom of the cake on top? Because it’s flat and has no exposed crumbs, it will be easier to add the frosting and it will be level! 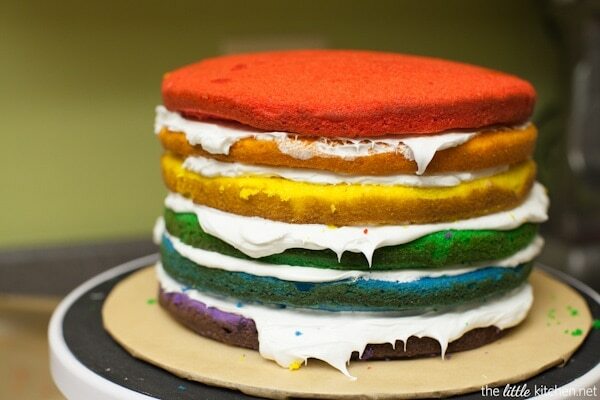 Press the cake down and then start adding frosting. I added about 1/4 to 1/3 of the can of frosting to each layer. 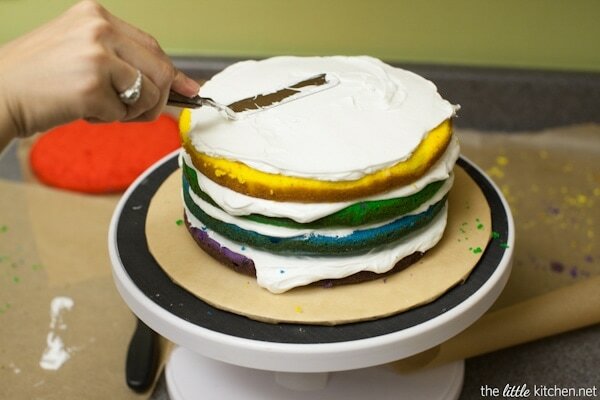 Use an offset spatula to smooth out the frosting between the layers. At this point, I was feeling so accomplished. 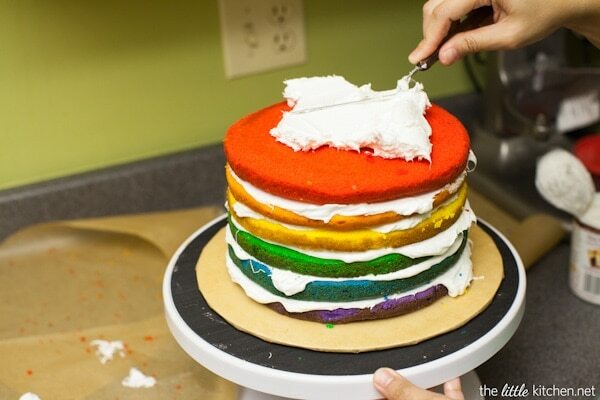 Ignore the mess behind the cake…this is what happens when you’re making a birthday cake…and it’s okay! I added frosting to the top of the cake and smoothed it all out. Now it’s time to even out the sides with the frosting. 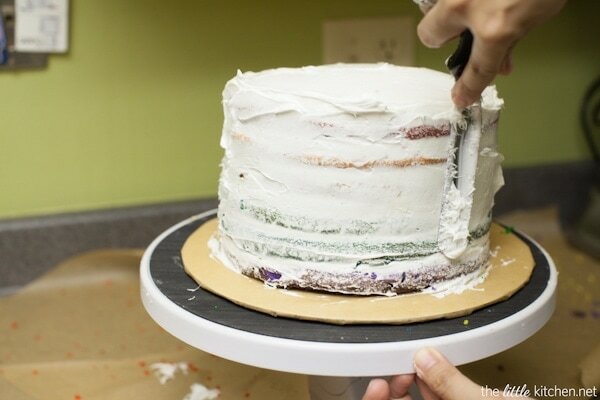 Using any excess frosting that’s sticking out between the layers, smooth it all out. This is the crumb coat, it’s okay if there are crumbs showing. Add more frosting to the sides and use your spatula to spread it evenly. Done! I felt so accomplished and excited! I put the cake in the refrigerator overnight. Since it’s a whipped cream frosting, I wanted to make sure it was completely stable before cutting into it. The next day I added nonpareils to it. So bright and pretty! And literally squealed with excitement! I couldn’t believe I did it…I was so excited and seriously, the gorgeous colors, it made me smile the entire day! 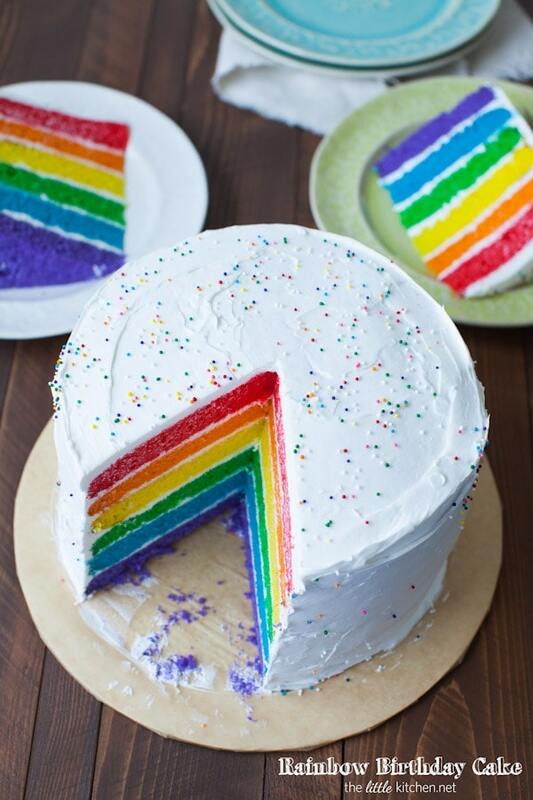 Now I’m more excited to try different color combinations and I’m definitely making this cake for my sister next February for her birthday. Love love love! Be sure to stay tuned, I’m going to share more birthday ideas soon and be sure to follow Betty Crocker on instagram for more ideas! 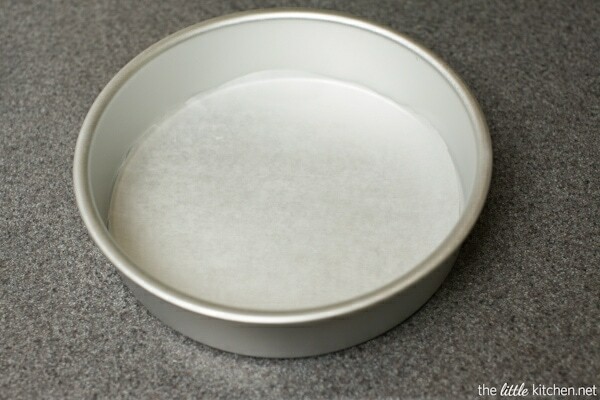 Heat oven to 350 degrees F. Using sheets of wax paper or parchment paper, trace along the edge of an 8-inch round pan. Do this 6 times and cut out round shapes. 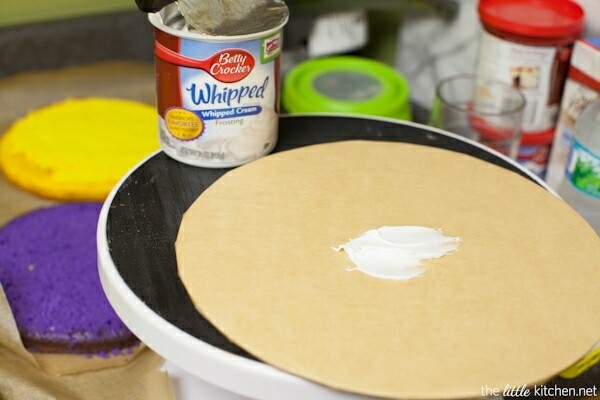 Spray the bottom of 3 (8-inch) round cake pans with baking spray. 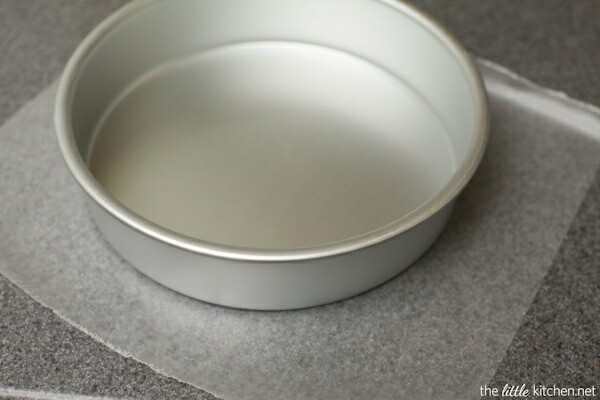 Place one sheet of cut out paper into each of the 3 round pans (or however many pans you have), press down to make sure the paper is flat. Spray the sides with baking spray and set aside. In a large mixing bowl, add one cake mix, 1 cup water, 1/2 cup vegetable oil and 3 eggs. Mix together until thoroughly incorporated, with a rubber spatula, about 1 or 2 minutes. Measure about batter evenly, you should be able to get about 1 1/4 to 1 1/3 cups batter for each pan. 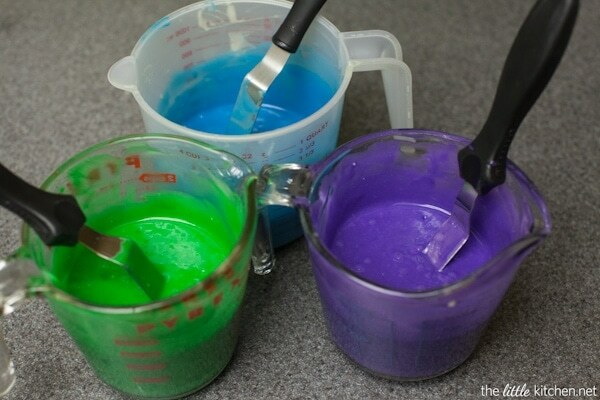 Using the food colors (in this order: purple, blue, green, yellow, orange, red) and working on one color at a time, drop 1 or 2 drops of gel coloring at a time into one bowl or measuring cup. Using a spatula, mix the batter. Add more color if necessary until you get the shade you want. Tint the divided batter for the first three colors. 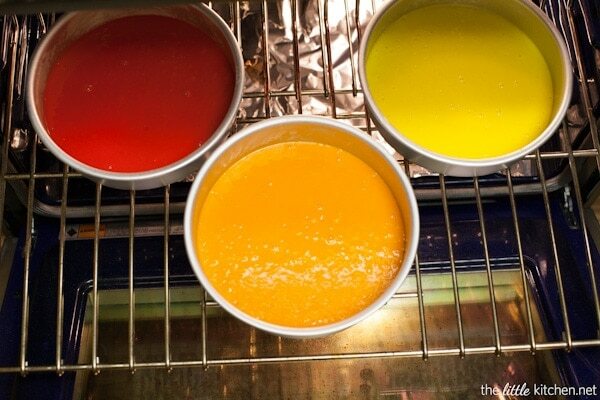 Pour the colored batters into separate cake pans. Make sure batter is spread evenly across the bottom of the baking pan by tilting it. Then, tap the cake pan on the counter a couple times. Bake for 15 to 16 minutes on the middle rack at 350 degrees F. Use a toothpick inserted in the center of the cake to measure doneness, there should be no wet cake mix visible and the toothpick should come out clean or with a little bit of crumbs. Allow cakes to cool for 5 to 10 minutes in the pan. Being very careful because the pans will be pretty warm or hot, flip the cake pans over cooling racks. Remove the paper and discard. Allow cakes to cool completely. Allow the cake pans to cool a little bit and then wash them. Bake and cool remaining 3 cake layers as directed repeating steps 2 to 5 with the remaining colors. Place each cake on a flat surface (I put them on parchment paper on my kitchen counter) and carefully trim rounded tops off cakes to level them (but this is optional). On a serving plate or I used a cardboard cake round that’s covered in parchment paper, put a little bit of frosting on the plate. 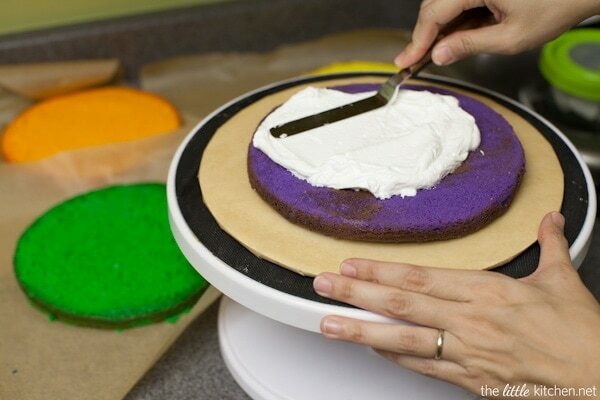 Place the purple cake layer (with the smooth side or bottom side UP) and push down with your hands to ensure the cake stays put. Add about 1/4/ to 1/3 can of frosting to the top of the cake. 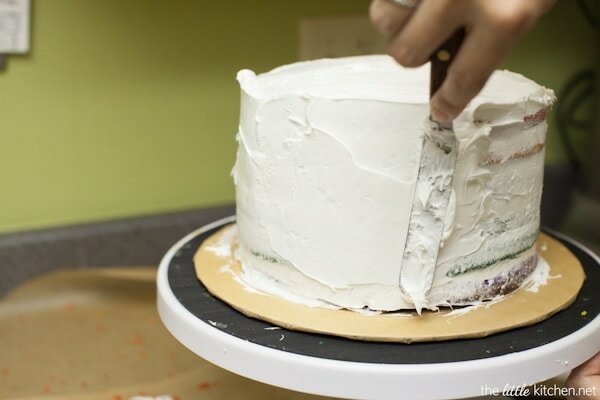 Frost the layer with frosting to within 1/4 inch of edge with an offset spatula. 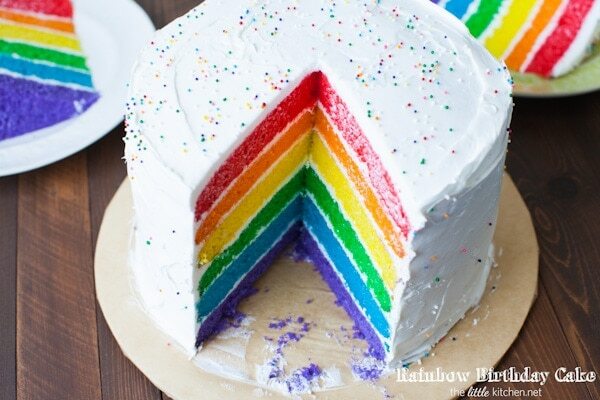 Repeat with blue, green, yellow, orange and red cake layers. 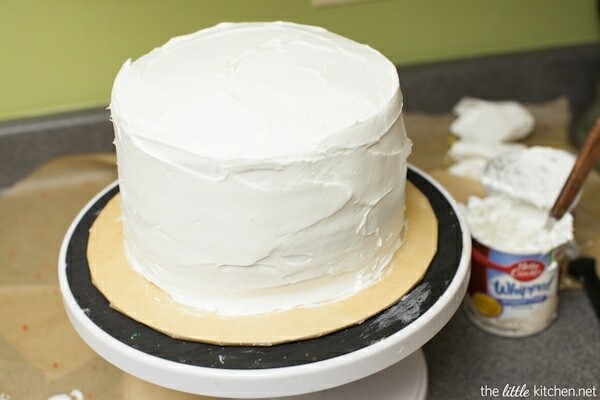 Add frosting to the top of the cake and smooth it out. 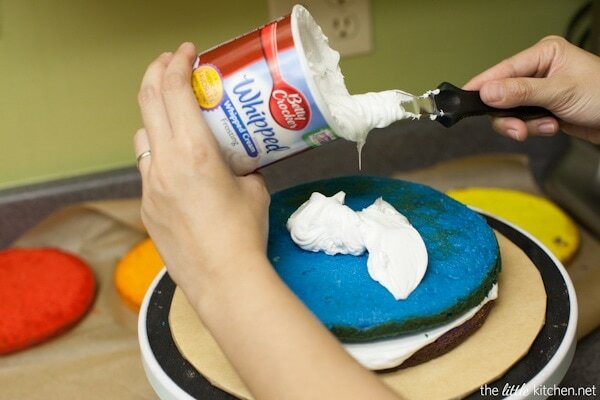 Using your spatula, even out the sides with frosting, add a light coat if needed. 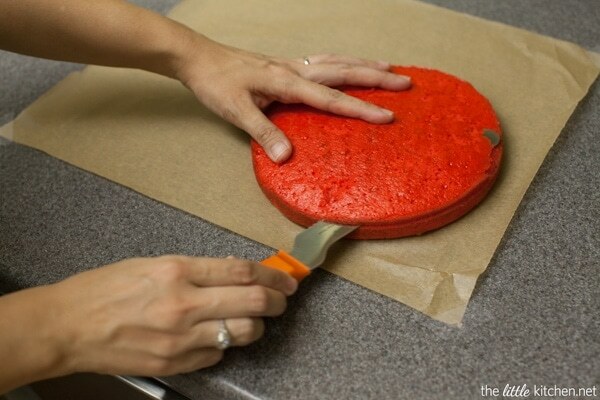 This will seal in the crumbs and it’s okay if any cake is showing at this point. Add more frosting to the sides and spread evenly with the offset spatula. Refrigerated the cake for at least 4 hours or overnight before cutting. Add nonpareil decors and serve.